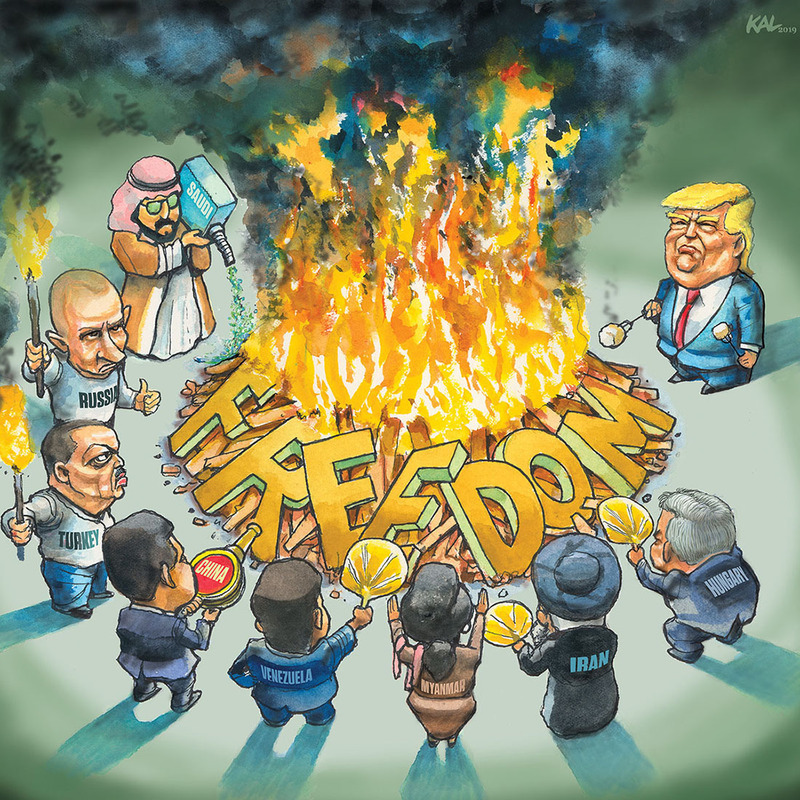 The state of the union, first of all, is relative, and, just in time, Kal Kallaugher has provided the cover illustration for Freedom House’s state of world freedom report. They feel World Freedom is in decline, but I like how Kal gets Dear Leader off the hook — he’s not adding to the problem. He’s simply benefiting from it. And, by the way, they have a lovely interactive map upon which you can check on the various countries of the world, even if you aren’t going to read through the report. It might be kind of fun to take the scores of Dear Leader’s best buddies, add them up and see if they total ours. But let’s explore that American freedom level. 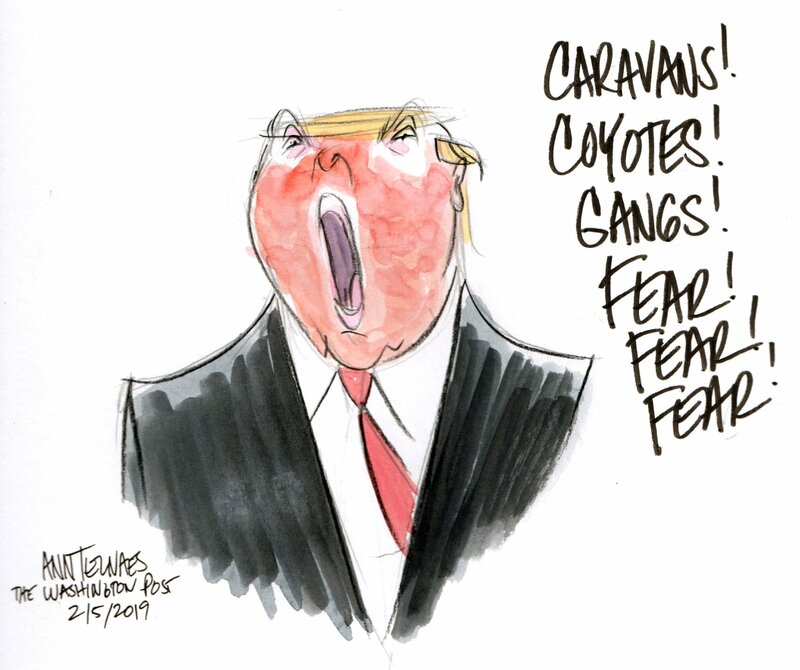 Ann Telnaes live-sketched the address. 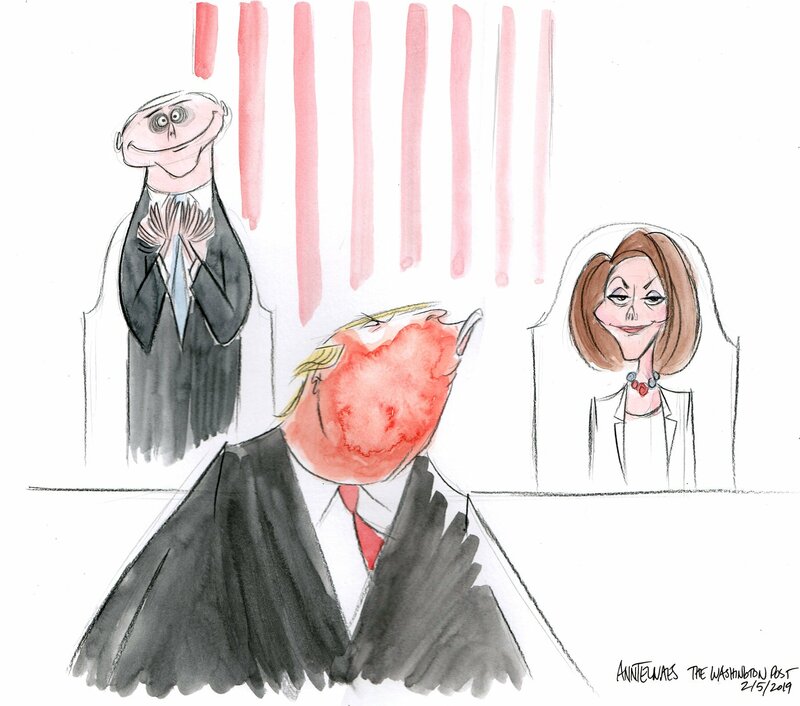 Much has been made of the half-hearted applause Pelosi directed his way, which, as I understand it from right wing cartoonists, is the first time in the history of our nation that an opposition Speaker failed to go absolutely bananas in support of the President’s remarks. Or maybe just the first time a creepy girl failed to be properly impressed. 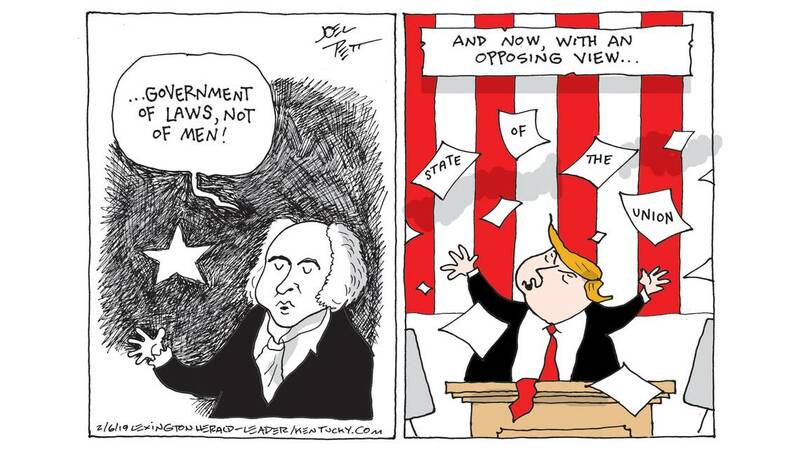 As Wiley Miller points out over at Non Sequitur this morning, it doesn’t matter what girls do but rather whether they are likeable, and if you think that’s only a GOP failing, you haven’t been paying attention. 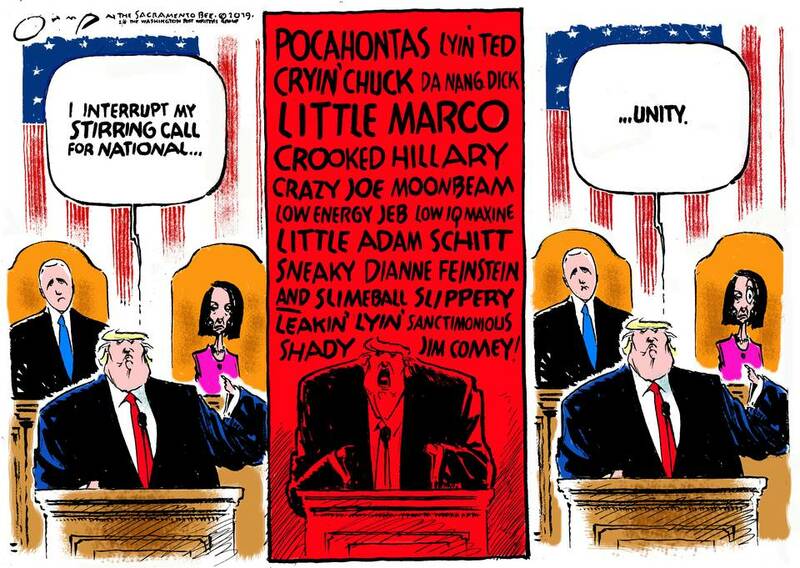 However, while the President hasn’t bragged of grabbing men by the crotch, he is an equal opportunity bully, and several cartoonists have pointed out the disconnect between Trump’s claim that he was seeking unity and Trump’s behavior in working to divide the nation. 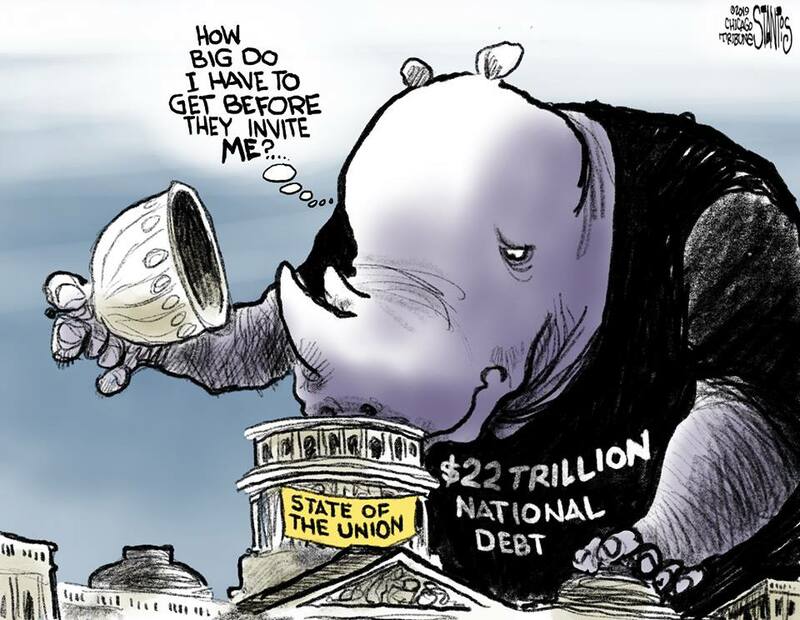 Jack Ohman posted this before the speech, drawing upon Dear Leader’s proven track record. 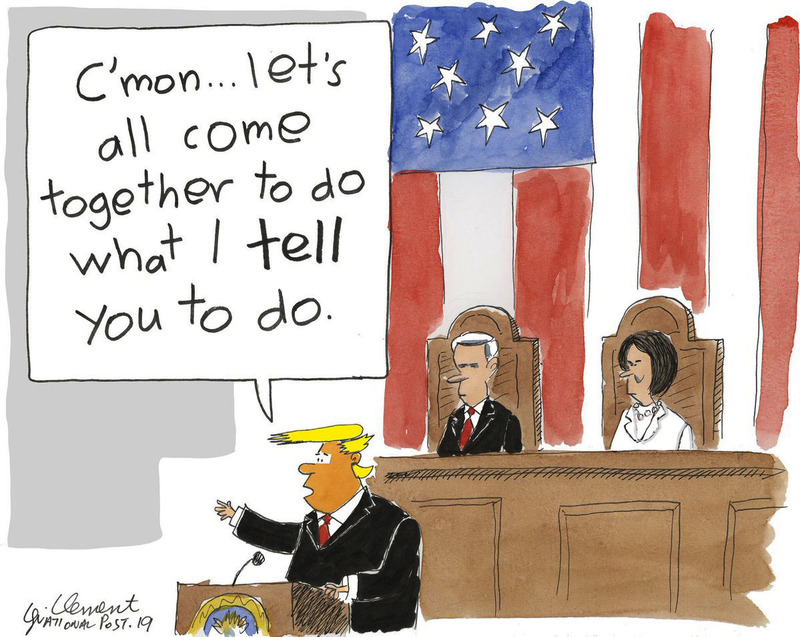 While Nick Anderson waited so that he could comment on how it exhibited itself in the actual speech. Whoever wrote the speech managed to blend some semblence of dignity with Trump’s normal tone of theatrical bombast, and the twin boogeymen of late term abortion and socialism, I’m sure, were good red meat for his base, particularly distorted to the point where, like the meat Trump prefers, they bear no remaining traces of their original color, texture or flavor. Note that he did not invent this approach to either topic. 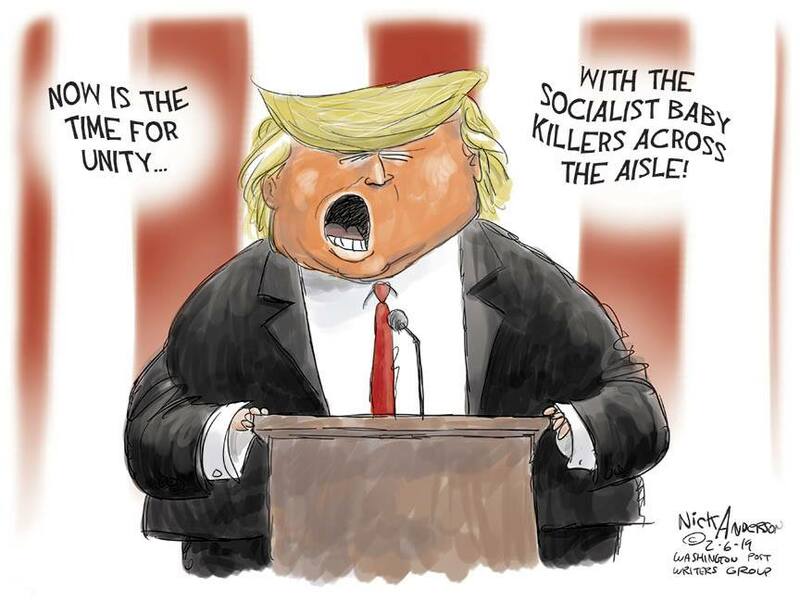 However, as Telnaes duly records, he did add to the list of scary, scary reasons we should listen to him and not those socialist baby-killing liberals. As Darrin Bell records it, the claims of improvement he has made do not seem to stand up to a whole lot of close examination. 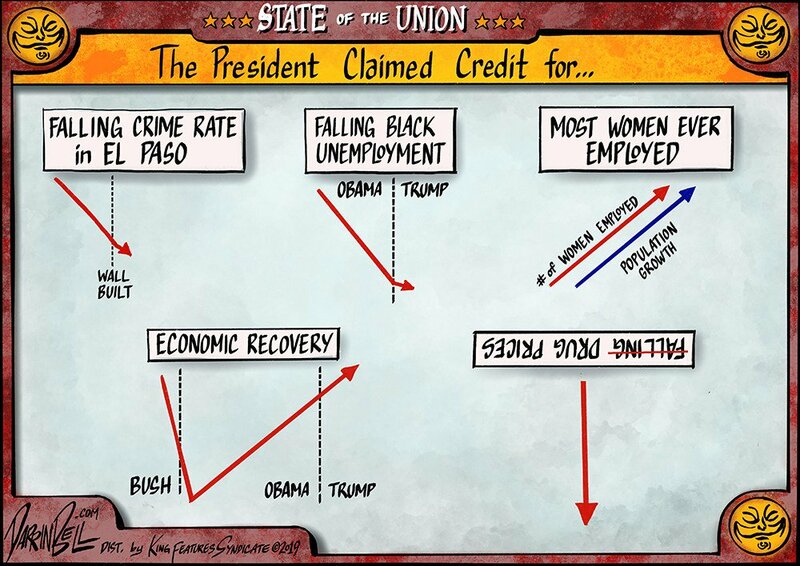 However, to be fair, Trump is hardly the first rooster to take credit for the sunrise, and, much like Bell, NPR’s fact-checkers did more to provide context than to dispute claims. However, to be unfair, Fox, which apparently hadn’t received the Unity Memo, promptly decried this as bizarre nit-picking. I think Gary Clement properly points out the disconnect, which is that True Believers don’t compromise, and nobody should be surprised that Trump, like Nixon, like LBJ, feels that “come, let us reason together” is no more an offer to concede a few points than if you heard it from an evangelist on your doorstep. We shall talk until we agree that I am right. Scott Stantis was less concerned with what was discussed than with what was ignored. But, hey, we don’t spend money on everything, and there are times, as Dan Wasserman notes, when we simply have to draw the line because we just can’t afford to spend any more. Not the way we play it these days. There really, really aren’t. I didnt bother listening — as a Canadian, I find that what your president says really means little in the long run. But one thing did stick out that I notice hardly anyone picked up on. Trump announces this mega-billion proposal to end AIDS in ten years. This comes right after he’s dismissed his entire AIDS/HIV advisory panel and has cut the budget for research. I gather his solution is to just let AIDS patients die off? I have no idea how it would cost that, unless he’s planning on putting it into defence and have soldiers running around the country and shooting people with the disease, so as not to make them a burden on the healthcare system and to raech his proposed goal. But then, who can explain anything this man says?